What is it like to work as an FOI Officer in an under resourced department? FOI Man brings you a guest post explaining what it’s like being an FOI Officer with limited resources. Today’s post is a guest post from an(other) anonymous FOI Officer. 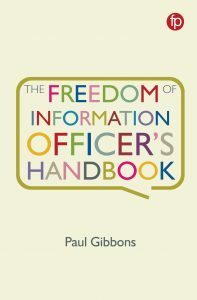 I think it gives a powerful insight into the challenges facing many FOI Officers – which after all is what this blog is all about. Please do leave comments – I’m sure the author will want to hear them, and I do too. Meanwhile if you want to submit a guest post, drop me a line at foimanuk (at) gmail dot com. The next few weeks will be very busy for me (not just at work), so a few guest posts will keep the lights burning here in FOI Man HQ. For almost six months now, the resources available to manage FOI requests at my public authority have been reduced by half. This was as a result of cost saving exercises in my public authority, targeted at the Corporate/administrative staff many journalists love to hate for their lazy, useless, red-tape loving ‘non-jobs’. Cuts which are referred to internally as something like ‘Becoming More Brilliant’. At the same time, the volume of FOI requests has increased yet again, and crucially, my non-FOI workload also dramatically increased. Absolute hell. Demoralising, stressful, and depressing. As an FOI Officer I believe in FOI. I want to do a professional job. I take pride in meeting the deadlines. I genuinely want to do a brilliant job, not just for my own professional career and reputation but for the requesters. Yes, I moan and grumble about some of the annoying requests, but my approach to them in practice is absolutely professional. Ever since my team took on FOI we’ve been consistently meeting around 95% of FOIs within their deadlines: not perfect, but pretty good compared to many others in my sector. We were proud of that. When the cuts were proposed I warned that the impact on my workload would mean that we’d see that drop to about 60% or worse. I put forward every argument I could muster to keep the resources I had. We’d have more complaints, more ICO interest, potentially a damning Decision Notice (we’ve only ever had one since 2005 and that was for a request that was not passed to the FOI team). And guess what? I was proved right. Every month the number of requests we’ve been able to meet within the deadlines has dropped. A snowball effect, as the backlog gets bigger, it just gets worse and worse. If I’m off sick – which is more than likely, given the stress I’ve been under – or on holiday, the FOIs gets worse again. At first I tried to do everything and keep up with them all, but I could not physically manage it without putting myself in an early grave. I am forced to choose daily between working on the ever increasing backlog of FOIs, or working on the rest of my job, which has a direct day to day impact on ensuring that the service we provide to the public can continue. Some weeks all I can manage to do is to log the new FOIs and give them a reference number. I’ve decided that at least with this strategy, we will at least know the extent of the problem and our failings. And it gives the requester a reference number with which to complain about. And who does everyone think is at fault? 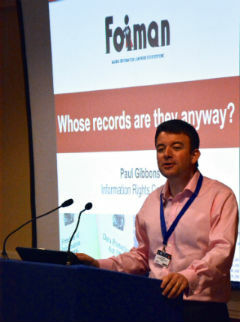 Me, of course, the FOI Officer. I log on and see more angry complaints coming in every day, accusing me of ignoring them or being negligent. Of course, they’re quite right to complain. But all I can do is apologise. I can’t explain the background to it, tell them I agree, understand, and explain everything I’ve done to try to ensure FOI is adequately resourced. It wouldn’t be professional. And anyway, why should they care? But one thing does make me angry. Have I ever heard of a request from a journalist asking about the resources public authorities give to FOI and whether it is adequate? And have I ever read an article from a journalist arguing that public authorities should properly resource FOI? I know this post is moany and self-pitying. But I can’t say it to the requesters still waiting for their answers, so I’ll say it to you. I’m sorry. I really, genuinely am. But if you want FOI to be dealt with properly, you need well resourced FOI Officers. It is as simple as that. Believe it or not, I’m on your side. Are you on mine? Good insight into the coal face of FOI. Sadly it is a story I hear all too often. Worse still such FOI soldiers have to beg, borrow or steal to get on training courses to keep their knowledge up to date. Training is the first to go in the cuts, despite the complexity and volume of FOI requests increasing. Having read this I feel somewhat relieved I’m not on my own. Being the sole FOI resource and not a full time one at that (I have 2 other areas of responsibilty)I struggle trying to maintain a high standard. Unfortunately my 100% clean sheet has gone by the by and with further pending redunancies it’s only gonna get worse. I get told to not worry about the statutory deadline and to stop stressing about the standard of responses. “If turnaround times don’t fall then who’s gonna know there’s a problem” – true enough but the flip side is this drop would undoubtedly reflect badly on me as a professional. It’s a lose lose situation. Thanks for your comment Jane. I think many FOI Officers will sympathise with the author’s plight (and yours). This is a very telling tale of the kind of thing that can go wrong when public authorities fail, or get their priorities out of kilter… where the choice for you is stark – an early grave, or improved resources. You may feel your anonymity helps you, and it does, but it also helps to protect your employer. In their wisdom, your senior managers thought they knew better than you and resourced you “accordingly” – there lies the rub – and your beef is with them. So why hit out at journalists? – the current state of the FOI Act gave you and all your FOI colleagues that particular problem, and it’s incidental. You’ve made approaches, that’s admirable, but they weren’t listening. More fool them? Will sounding off on this website help you, or just assuage your frustration? Will they ever read this? Would it change their minds if they did? Would they recognise it as their patch, and you as the author? Are you scared you’d be victimised for speaking out and making yourself known? Does your employer have a history of unfairly targetting and disposing of whistleblowers? You’re sounding off naturally, and we can all understand and sympathise with your position. But will this help you to directly improve those resources and avoid that early grave? Are you still going to fight it…. or continue to look after yourself and your family? Which of the following is your top priority….. personal health and wellbeing, advancement, the pursuit of money / climbing the greasy pole, public access to information, your work colleagues, other….? You must have pondered on what’s preventing you from going public, from standing tall and making yourself known? This is FAR more serious, but recently, three (and counting?) heroic Social Services staff exposed Wirral Council… and to spectacular effect. Last week, the whole rotten carcass of failed Corporate Governance was revealed by an external independent investigator. This was exactly the kind of failure that CAN cause funding issues like yours. Failure at the top level = more FOI requests = cuts in resources = a beleagured department. A vicious cycle that can be seen by the sheer number of WDTK requests sent to Wirral Council (whose FOI dept used to consist of one harassed member of staff and one spreadsheet). Is anything going wrong at your employer? Are these cuts expected, proposed and planned for long ago, or are they sudden and poorly explained? Is it possible your problems originate from the incompetence / misconduct of senior staff / (councillors? ), getting their decisions wrong, or behaving immorally? I know stress. I’ve done stress. Twice over as a whistleblower, with all the trappings. One aspect of this was I signed away my statutory querying rights to FOI / DP when pressurised by my last employer. But as far as whistleblowing goes, I like to think the whole disgusting charade, which speaks of ‘robust’ policies and procedures but delivers misery for staff like you, is collapsing and the tide is turning. Do you want an early grave, or do you want to live, thrive and continue to stand proud, secure in the knowledge that you put your name to it, spoke up, and did your absolute best? Taking anonymous potshots at anonymous journalists can become tiresome and futile. It may keep the merry-go-round spinning, but will get you nowhere. Because the problem here lies elsewhere. ps. I’m on your side. Could you please explain what you meant by “I signed away my statutory querying rights to FOI / DP when pressurised by my last employer”. How? Why? There’s a large ‘club’ over my head, which would take the form of court action, funded by public money, preventing me from explaining the close detail of this. At least beyond a small group of others. Paul, you seem to be criticising the author for writing the post in the first place (which is an odd thing to do given that it’s very much in line with the general theme of this blog, which you seem to read on a regular basis). How do you know that they aren’t taking other routes to tackle the problem? I’m not sure that I saw anything in the post as being “anonymous potshots at anonymous journalists”. In my opinion, the author merely makes a reasonable point that the journalists who use the Act could use it to good effect to highlight resource issues affecting FOI itself. Anonymity is double-edged. I don’t know who you are. I don’t know who your employer is. I don’t know who the author is. I don’t know who the author’s employer is. Both employers, assuming they’re separate and distinct, also benefit from this. The author mentions that he approached his employer, but doesn’t mention any other more public routes taken to tackle it. I’m commenting on what’s IN the article. Maybe the author will come back and fill us in with other avenues explored? I feel the thrust of anyone’s opinions or argument is reduced when they don’t put their name to it. You must be aware of that aspect. You can be free to spread your wings and criticise your masters beneath a cloak of anonymity, because e.g. your job security during a recession might be undermined otherwise. Yes, that threat of victimisation is SO real. You’re also maintaining an identity, which at some point you can sacrifice, change moniker and start up safely as “someone else” should it all go badly wrong. – what threat of victimisation? I don’t feel victimised by anyone, let alone by my employer. In summary, I don’t agree that just because today’s writer or myself write anonymously, that means we’re somehow avoiding the issue. I think we’re both using our experiences to stimulate debate. How we deal with our own employment situation is very much a separate issue for me. 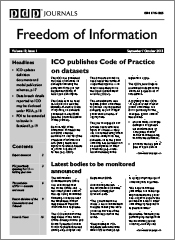 Wow, I appear to have woken up and written an article about FOI in my Authority and had it uploaded to a website and everything all in my sleep. I should probably see a doctor about this. What I have read is a very good article that mirrors much of my own experience at the coalface. Personally, I’m finding here that in additon to the press requests there is this almost pathological need of our own marketing bods to avoid release of anything that could put the Authority in a negative light. Now I’m not going anywhere near s.77 here but there have been plenty of cases where responses have been held up because of arguments and disagreements about how certain information might be perceived by certain parties and whether it is necessary to put ‘explanatory caveats’ along with the information or not. All of which takes us further and further outside of the 20 days, most of which is completely pointless and unnecessary and some of which is frankly laughable. I actually had a fierce debate with marketing bods about a response to a request in which we were giving information that had already been released because they felt we where going beyond what had been asked for! More requests than ever, fewer resources than ever and still having to fight colleagues every inch because they neither understand nor care that you know what you’re doing. The first two I can work with but the last is just a kick in cajones IMO. Agree with this, although it’s not just the cut in FOI resources that creates the problem. ‘Efficiency savings’ translates as ‘get rid of as many admin staff as possible.’ So that means the people I would normally rely on for to provide me with information for my answer are not there, making it even harder to get responses out on time. Thanks for your comment Alison (and apologies for taking a long time to approve it – busy day!). I’d agree with you there – in my experience the FOI people tend to survive (it terrifies bosses who hate the idea of having to deal with it themselves!). It’s the lack of resources out in departments that causes the real problems in terms of disappearing knowledge and less time to spend on getting the information back to us. That said, with request volumes going up, the pressure on us at the centre is becoming more of an issue I think (not so much losing resources, but not able to get any more resources to deal with a growing workload). Another key issue is that there is no resource to be proactive about publishing information which would/could be of public interest, which has the effect of increasing requests and raises the negative perceptions relating to lack of transparency. I find it incredibly ironic that politicians and journalists are generally those who shout most loudly about red tape, and “useless public sector bureaucrats” but are also those who demand greatest transparency and accountability. They’re right to demand transparency and accountability, but a little recognition that resource is needed to deliver those desirable and essential things wouldn’t go amiss. FOIA is here to stay and has brought many benefits to all and greater accountabality. I have been a FOI practioner and decision maker since enactment 2005. Requests, and inherently, complexity has increased. Locals will use the legislation to perhaps find resoluton in old grievances, others will try and expose via a story or investigation or just curiosity. The reseource at this authority has remained exactly the same since 2005 although the nature, complexity and intensity of the role has increased and diversified into the wider Information Gvernance remit. I am a professional and my reputation is sacrosanct as well as my professonal standards. Yes there are questionable requests ( not requestors!) and as I quoted to one of our more persistent requestors, “each request deserves an equality of treatment – so whilst I would like to send more time with you…..”. I sympathise with the original “poster” and frequently question does anyone else care other than the IG team?